How Many Driving Lessons Does It Take To Pass? East London Driving School is based in Bethnal Green and provides driving lessons throughout the East London area. According to their website, all their instructors are fully qualified and have a minimum of 5 years experience. 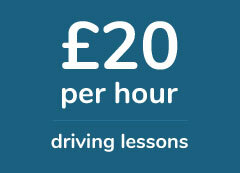 Learner drivers interested in their teaching methods can find their driving lesson plans here. This section of their website is really useful, as you can read up on each aspect of the driving syllabus and it has information on everything from dealing with junctions, to executing driving maneuvers. If you would like to be kept up to date with the latest driving news, the East London Driving School blog is regularly updated. You can use this section to keep abreast of all the latest changes to driving laws. East London Driving School does not have that many reviews online. On Facebook they have just one rating and there isn’t an updated profile on Yell. They have just 3 reviews on Google and 2 of these are 1 stars, so it is difficult to find out which of their driving instructors you should choose to learn with. You can find images of learner drivers who have passed with them, by visiting their success gallery. If you would like to purchase a gift voucher for a friend or family member, they have this option available. The advertised offer on their gift voucher is £18 for a manual driving lesson. You can also purchase gift vouchers for 5, 10, 20 or even 40 lessons. If you are a student, unemployed or work for the NHS, you can enjoy 10% off the cost of learning to drive with ELDS. As well as offering discounts and savings when you block book, they also offer free driving lessons through their refer a friend scheme. For each friend you recommend, you can claim one free driving lesson in exchange. If you have a lot friends who also need to learn to drive, this can reduce the cost of your tuition. It costs £70 to hire an East London Driving School vehicle on the day of your driving test. East London Driving School are really professional, they took me on at short notice and helped me pass my driving test after just 10 lessons. I had driving lessons with another school in the past and failed twice before contacting ELDS. Loved every minute of my lessons and my instructor was really helpful and very understanding. I was definitely ready to take my test when I did and East London Driving School were great with me. I have told two of my friends about them and they have booked. Satisfied with my instructor and the school in general. I passed on my third attempt. Copyright © 1999 - 2019 Book Learn Pass. All rights reserved.